from water; adsorption and catalytic reduction, a process involving the attraction of negatively-charged contaminant ions to the positively-charged activated carbon. such as chlorine and chloramines are removed by catalytic reduction. roughly 0.5 km² and can absorb literally thousands of different chemicals. of the contaminants are drawn to the surface of the carbon granules. ​Activated carbon filters remove/reduce many volatile organic chemicals (VOC), pesticides and herbicides, as well as chlorine, benzene, trihalomethane (THM) compounds, radon, solvents and hundreds of other man-made chemicals found in tap water. removing some, but not all, heavy metals. by higher quality activated carbon filters. so they are often preceded by a sediment filter (cloth filter). reducing the surface area available for absorption. 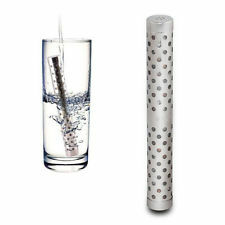 (least effective) down to 0.5 microns (most effective), which is what is used in our filters. 1 Micron = 1000th of a millimetre in size. are bituminous, wood, and coconut shell carbons. it is generally regarded as the most effective of the three. All of our filters use coconut shell carbon. and can adsorb literally thousands of different chemicals. CATALYTIC REDUCTION: a process involving the attraction of negatively-charged contaminant ions to the positively-charged activated carbon. DISCOUNTED PRICE PICK UP OUR SERVICE STATION SINGLETON.